HOUSTON, Texas -- An East Houston tenant claims his landlord left him with 12 pit bulls to care for. "I paid her the money out here (in the front yard), then we went in and I seen what was happening. The dogs were on the front porch in a box, the puppies," says Tommy Howard. There are nine puppies around a month old, two older puppies, and their mom. Howard moved into the house on Sacramento Street about a week and a half ago with his son, and friend Les Baird. "I moved them out to the shed, told her you need to come feed the dogs. She has not been here to feed these dogs, water them, or nothing in over a week," Howard says. "We're laid off," Baird says. "We can't afford food for them. It's very sad, especially to see mama dog like this. 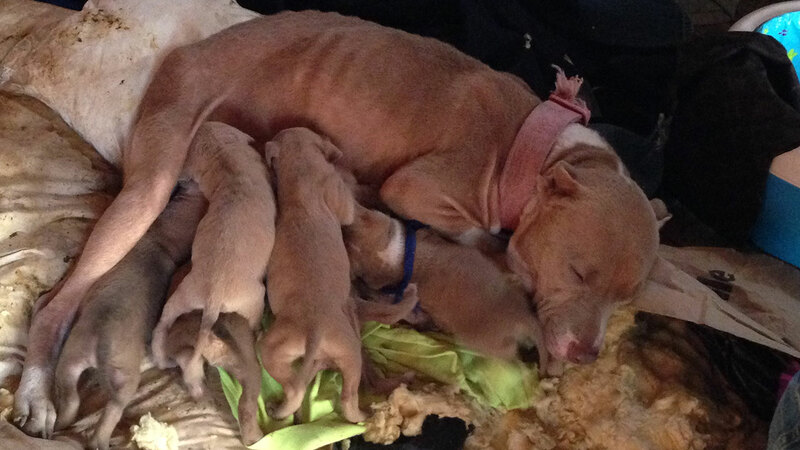 She's starving, trying to feed nine pups." They tell Eyewitness News that a neighbor has fed the dogs a couple of times. Tommy and Led say they called Houston BARC to come rescue the pits. "They said since we fed the dogs they're our responsibility. They're not our dogs bug we don't want them to starve to death," says Baird. BARC confirms they did get an anonymous call from the house. A spokesperson says they couldn't just roll up and take the dogs away. "We cannot legally take those animals from the premises unless the landlord gives us permission to do so," says Ashtyn Rivet. But after seeing our video, that gray area cleared up. "In this case what we're going to do is take a huge bag of dog food to the location so the tenants can feed the dogs over the weekend," Rivet says. HPD is now involved. An animal cruelty investigator has called the owner. If they don't hear from her by Tuesday they'll pursue a warrant to remove dogs.